I’ve never really cared much for burgers in the past. I’ve liked them, they’ve been fine, but I’ve never loved them. 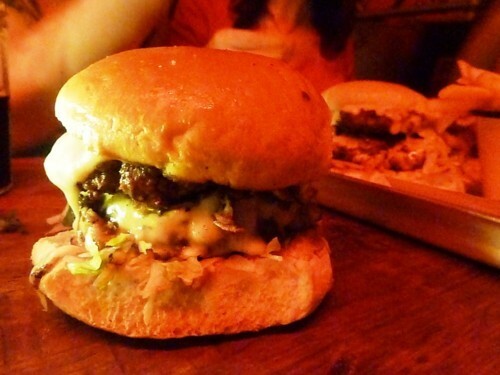 However, there seems to have been a bit of a burger revolution in London of late, and some of the burgers being produced are out of this world. 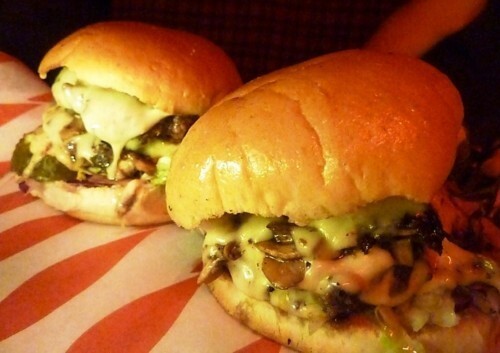 It’s now become a topic of debate…who does the best burger in London? 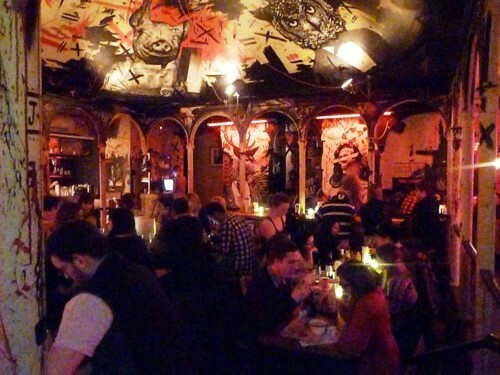 The closest contenders seem to be Lucky Chip and Meat Liquor. 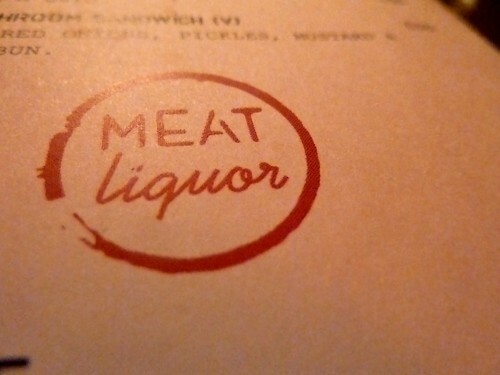 I’ve had many Lucky Chip burgers and LOVED them but I only tried Meat Liquor out for the first time last week. 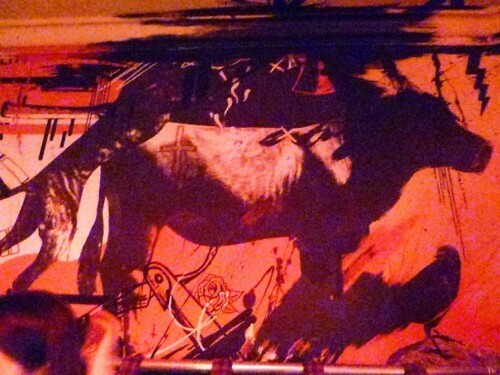 Meat Liquor is Yianni Papoutsis’ new venture. Yianna was featured in Jamie Oliver’s Great Britain TV programme when Jamie went to visit his Peckham-based Meat Wagon http://www.youtube.com/watch?v=_QlSKZy9bsw, a pop-up burger van serving incredible burgers in a car park. 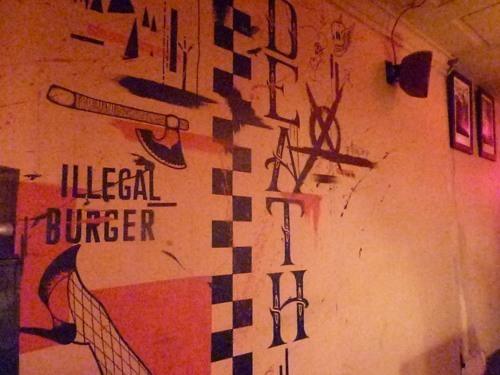 Ever since I saw this programme, I’ve been desperate to try one of those burgers so I was delighted to discover that Meat Liquor was opening round the corner from my office, just off Oxford Street. I took my Lucky Chip eating buddies, Cassie, Carmen & Fenella, with me so we could all compare together. Our Qing policy is straightforward and we believe fair: If there is a Q when you arrive, you join the end of it. 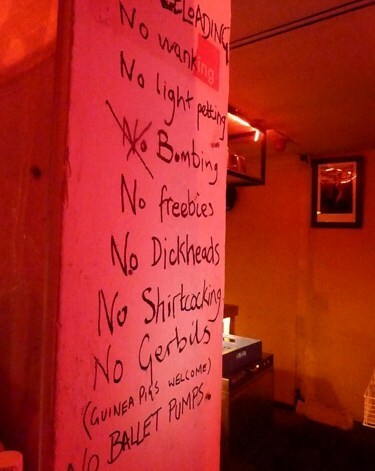 NO exceptions, EVEN if your friend / date / boss / probation officer / master / gimp is already inside. Ta. When you walk through the unassuming door across the road from Debenhams, you enter a whole other world. It’s a lot larger than I was expecting and it kind of feels like you’re under a bridge! 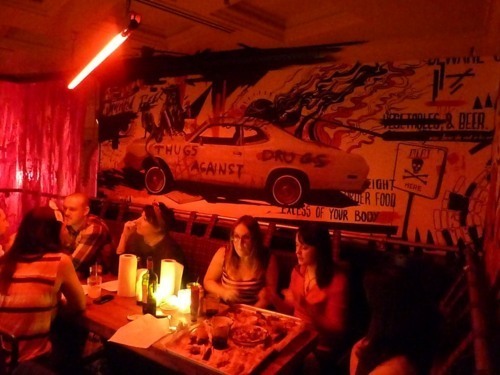 It’s dimly lit with red and black graffiti-style illustrations on the walls and its buzzing with atmosphere and noise. I was in the mood for a cocktail and quickly noticed the ‘Wagon Girl’…Tanqueray Gin shaken with fresh strawberry, lemon juice and honey. Wow, this was so delicious. 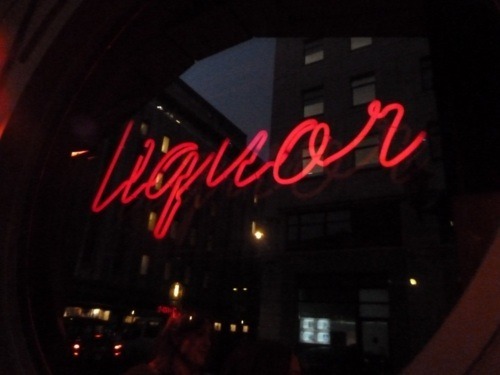 But a little bit too drinkable. I’m a big gin fan anyway, but with the sweetness of the strawberry cut through with the tart lemon and a sweet honey finish? I was in heaven. 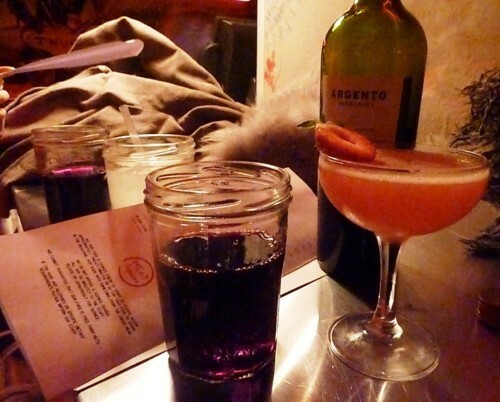 The girls ordered wine which was served to them in Mason Jar glasses, which whilst not being proper Mason Jars, this is probably one of the only places in the UK you can drink out of them. A nod to the authenticity and proof they have done their research. Which gives them top marks. I always tend to favour a cheeseburger when I’m sampling out a new burger place, that way I find it easier to compare them. 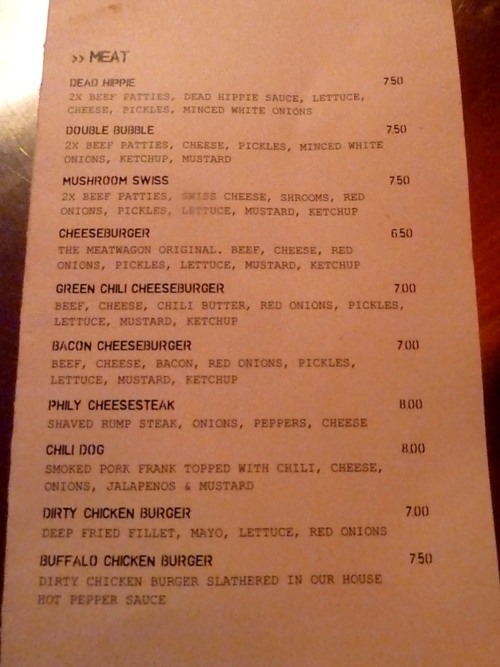 I was about to order one but the (very friendly and helpful) waitress suggested I order the Mushroom Swiss instead. She said the cheese on it was better than the cheese on their basic Cheeseburger. As I love mushrooms, I was more than happy to go with her recommendation. The food came pretty quickly. I imagine there is a pretty fast production line happening in the kitchen. It is served on large, lined trays which I think is more for the waiting staff’s benefit, rather than the eaters. Its easy for them to carry, plop down and clear up. But personally, I would prefer my food to be placed in front of me, as opposed to everyone at the table grasping at the food, lifting up burger buns to see which burger is which and which one belonged to whom. Also, its pretty messy eating and it would be good to have a plate underneath to catch everything that falls out. To be fair, they place large kitchen rolls on the tables for mopping greasy hands and mouths, but I would still like a plate as well. Anyway, onto the food…Cassie also opted for the Mushroom Swiss ( 2 x beef patties, swiss cheese, mushrooms, red onions, pickles, lettuce, mustard & ketchup) and Fenella and Carmen went for the Bacon Cheeseburger (beef, cheese, bacon, red onions, pickles, lettuce, mustard & ketchup). I loved my Mushroom Swiss. The waitress was right…the cheese was lovely, the meat was well seasoned and very juicy and the bun was so soft. I must say, I didn’t really taste the mushrooms, but maybe it was due to the speed I was eating it…I practically inhaled it! If I’m comparing it to Lucky Chip, I’d say that the beef patty is served slightly rarer in Lucky Chip than in Meat Liquor. But I reckon if we’d asked for medium rare we would have got them. I think they send them out medium well as standard. 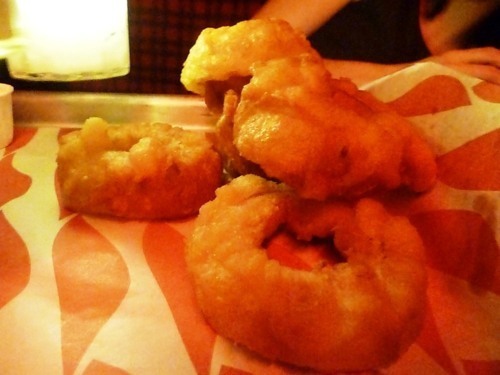 We also ordered a portion of deep fried pickles which were served with a blue cheese dip – these were really delicious. I wouldn’t normally have ordered them so I’m really glad someone else did. 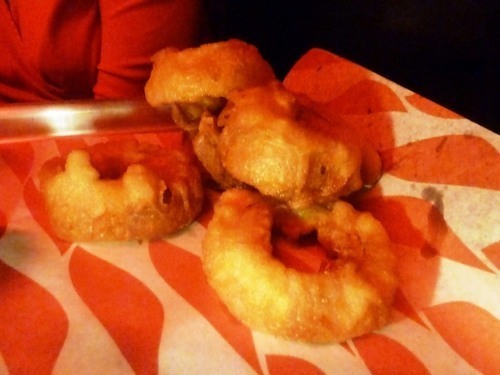 Onion rings….these were the BIGGEST onion rings I’ve ever seen! Wow, they were good. The batter was so light and crispy, the onions so sweet and delicious. They’re ridiculously moreish. I could have eaten these all night. 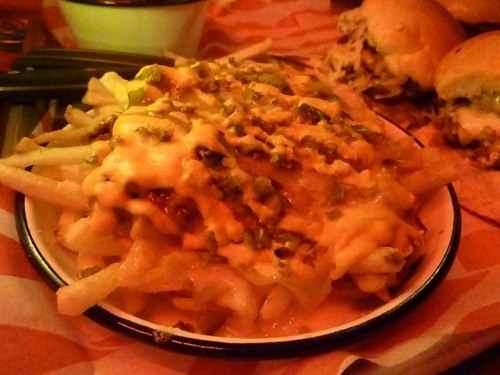 The girls ordered the chilli cheese fries – fries, chilli, cheese, onion, jalapeños, mustard. I went for the standard fries which were really good. 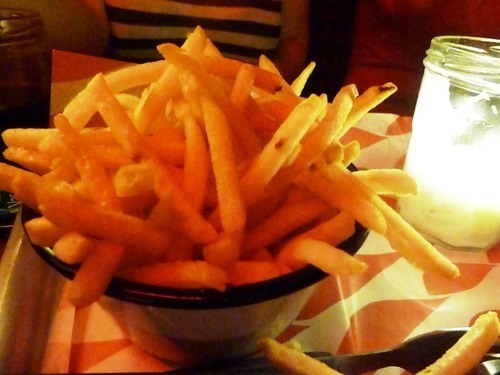 Thin, crispy, salty…everything fries should be! Overall, we were very impressed. 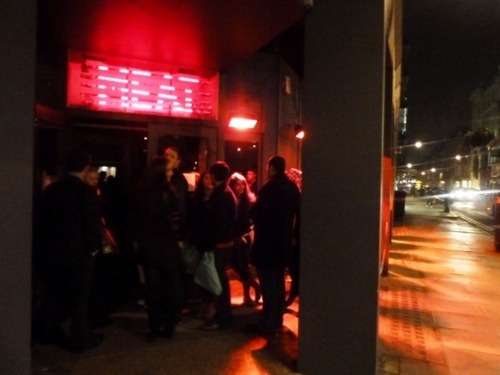 I’d heard all sorts of things about Meat Liquor before I went, from tales of incredibly rude staff to hatred of the queuing system. Nothing bad about the food mind you! 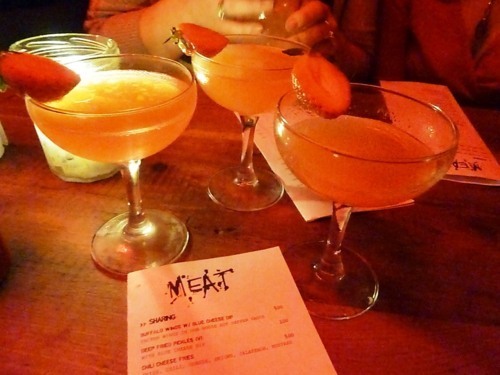 Judging by the amount of comments I’ve heard, my friends and I were either extremely lucky on the night, or Meat Liquor have listened to the comments and made suitable changes. Whatever the circumstances, all I know is that we all had a great night out. We didn’t have to queue for long, we had a really friendly waitress who couldn’t have been more helpful, everything arrived pretty quickly, we had great cocktails and even better food. 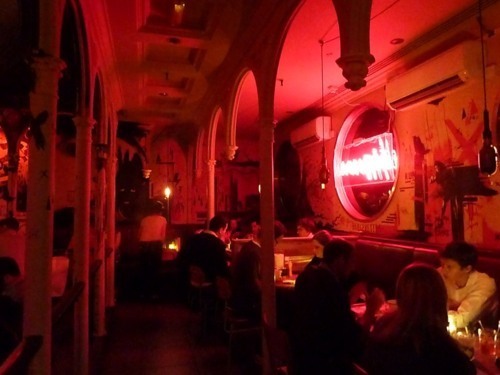 As we stumbled out, we discussed how Meat Liquor compared to Lucky Chip. Overall, it won. Only Carmen was of the opinion that Lucky Chip serves the superior burger. She felt that the meat is better at Lucky Chip. 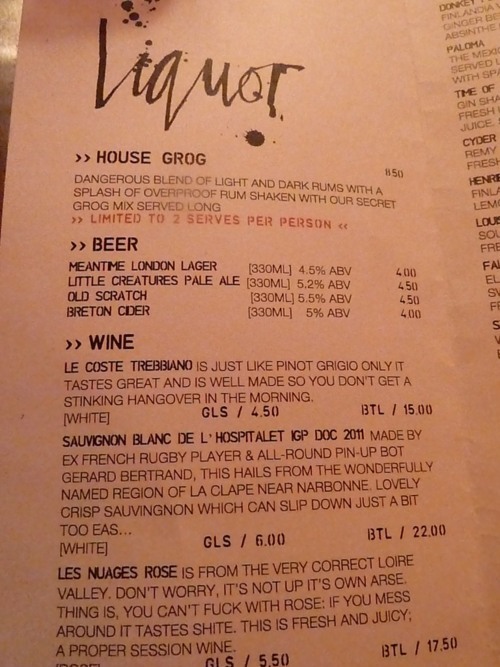 This could be because they serve it a bit rarer, I’m not sure. Personally, and I know this is a really odd choice, but my favourite burger at Lucky Chip is actually their vegetarian burger, the ‘Eastwood’. 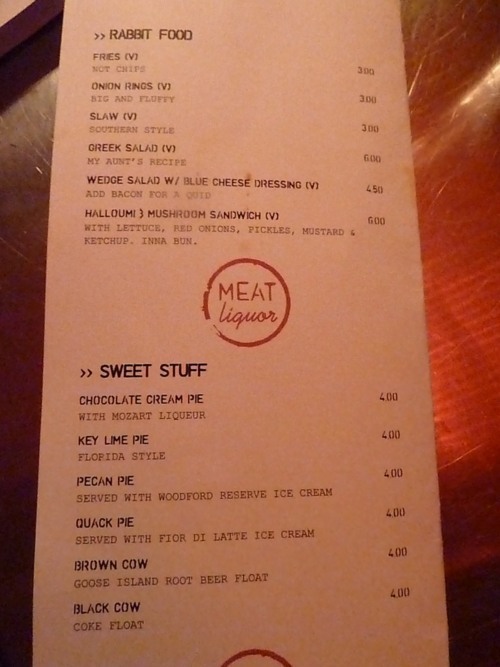 If I had my ideal situation, it would be to have the Lucky Chip ‘Eastwood’, at Meat Liquor, with all the Meat Liquor trimmings. 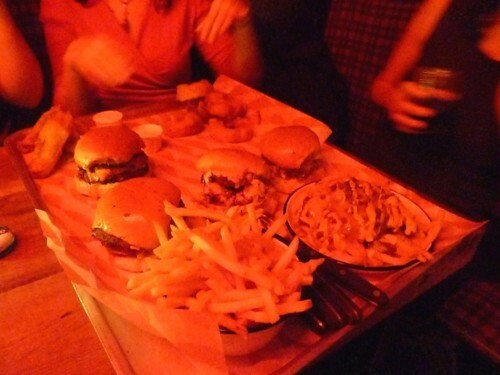 No matter what, whether you eat at Meat Liquor of Lucky Chip, you’re going to have an outstanding burger experience, so it doesn’t really matter who’s is best. Its all personal anyway. 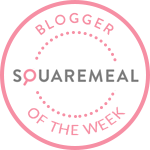 With the amount of choice on each menu as well as the burgers I’ve been told to try out at Admiral Codrington, Goodman, Bread Street Kitchen and Hawksmoor, there’s never been a better time to be a burger lover in London!